Holi hai!! Do you play holi? I do! Holi is a festival of colors. A festival which is believed to bring colors of love, care and affection between people. We celebrate holi and make it colorful in our own special way. 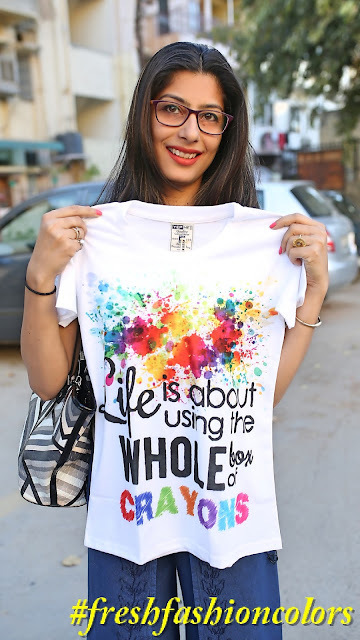 Have you ever experienced someone else adding different shades of colours to your life on holi? No? Then you should be yepme customer to get colored and get surprised. Yepme is an online shopping portal where you can find huge variety of hand picked fashion designs. Yepme as a brand is known for customer satisfaction. Yepme believes in bringing happiness in life of their customers through their products. This holi yepme team visited there customers at their places with a small surprise. Surprise was something which yepme is best at, a T shirt. Yepme team gifted holi T Shirts specially designed for their customers. Yepme has team of in-house designers who pick the right fabric and design right piece for you. Apparels from yepme are known for their soft, light and airy fabric. A fabric which takes care of the skin and feels just like skin. A garment when worn should be of good fit, good style and good fabric. Combination of all three makes a garment more wearable. In your closet you have many shirts,T-shirts and tops, among them only two or three are your most favorite and you wear them quite often. Yepme believes in making a garment which is combination of good fabric,style and fit. They believe that every garment that they sell becomes your personal favorite and you wear it more often. I have shopped from yepme couple of times. Whenever I browse to the website I find something new and interesting every time. As a customer, I want to shop new designs in the market at affordable prices. Recently, while shopping for my best friend I found a watch which looked very different from the regular watches available in the market. We have limited options to shop for men in the market. If you buy a watch you either get metal strap or leather strap with slight differences in the dial. But now as the high street fashion is changing ,to keep you updated with trends yepme team is constantly working towards it and they bring you latest fashion trends from the ramp. Watches with canvas straps are different and new. You can easily get them at super affordable prices at yepme.com with warranty. Yepme has varied range of products and you can shop products for every age group. The website layout is user friendly, everything is categorized and sub-categorized very well which makes search for a specific kind of product quick and easy. I have always been satisfied and convinced with products I have shopped from yepme. Their after sales services are also good. Exchange and return policy are easy and hassle free. I am touched by the fact that a brand can actually be so thoughtful. The idea of gifting something special to their customers on a festival like holi and capturing their reactions is simply amazing. Yepme is planning to add these happy reactions in book of Yepme customers for lifetime. A brand builds up their image by its customers and if their customers are happy, that is all what they need. 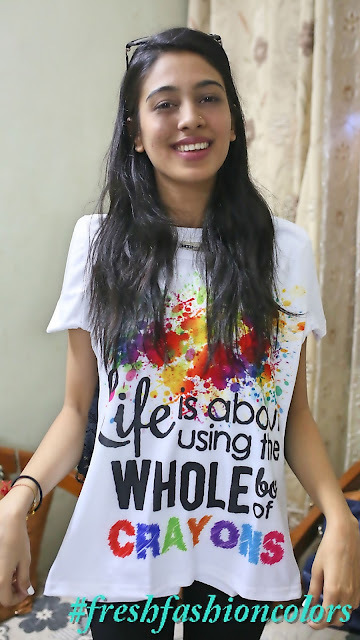 Yepme decided to add colors of surprise and happiness on holi. Though this initiative of the brand was restricted to Delhi NCR region , but the brand is planning to bring happiness beyond NCR in future. So friends if you are planning to shop something in near future do check out www.yepme.com and shop happiness. Yepme is one stop shop for all your requirements be it trendy tops, rugged denims or casual watches. They have a celebrity styled section where you can find celebrity fashion at affordable prices. So guys what are you waiting for? Go and shop and look your fashion best in yepme. Such a amazing post. surely will visit there.